If someone had told me that an 89 cent can of beans turned crispy by way of just olive oil, salt, and less than an hour in the oven would elicit the same unglued squeals that an announcement of, say, a trip to Disney World in families with a mother not pathologically afraid of costumes might do, I'd have been making them every week since first trying them at a shoebox-sized tapas restaurant in New York eight years ago. If someone had told me that the same child who asked Santa for a unicorn Stuffie this year would then, quite possibly in the heat of the moment, announce that she wanted nothing more for Christmas next year than two batches of crispy chickpeas, I'd have become a notary public in order to officially document such a critical proclamation. Now, I can't promise the same ballistic reactions in homes, perhaps, more indifferent to soluble fiber, but I can offer the upshot of a cautionary tale with a not-so-delicate ending--eating an entire recipe of crispy chickpeas is the same as eating an entire can of beans. They are decidedly addictive, but do try to keep your wits about you. 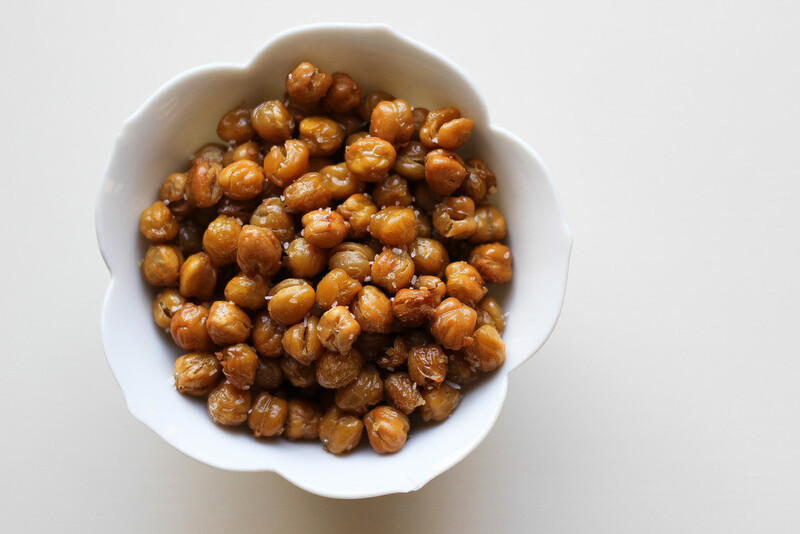 Disclaimers aside, these habit-forming legumes will be a linchpin of the snack offerings at an upcoming birthday celebration, because as the hostess's infinite wisdom and vast experience in event planning have informed her: "It's just not a party without crispy chickpeas." Dry the beans by gently rolling them around on paper towels. This also helps to remove any loose skin (on the beans, not your triceps, sadly). Place the chickpeas in a bowl and toss with the olive oil, half of the salt, and any of the spices you are using. Spread the beans in an even layer on a rimmed baking sheet lined with non-stick aluminum foil and roast until beautifully bronzed and crisp, about 40 to 45 minutes. Sprinkle with the remaining salt when they're still warm and impressionable. Eat now, storing any unlikely survivors in a baggy or container at room temperature.